Set your PT Chrysler apart from the rest with this nostalgic Flame Graphics kit. Available in four (4) color combinations, kit is PRECUT and ready to install. Light trimming required at Hood, Fender and Door jamb areas. Graphic kit consists of prefitted and contoured pieces as shown in the illustration. 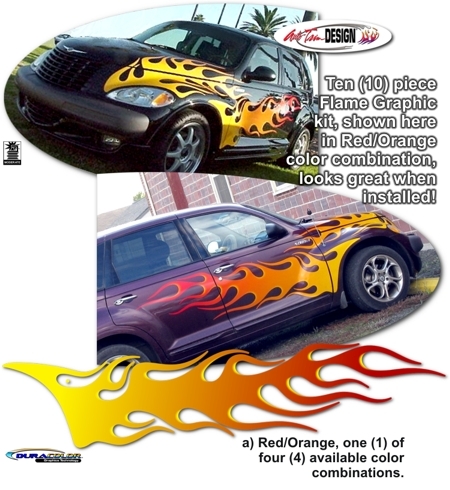 Thus, kit is specifically made for the 2000-2010 Chrysler PT Cruiser factory Hood, Fender and Door areas and will not fit any other vehicle. A Word about this Graphic: Kit was carefully designed as a reproduction to the Flame Accent kit once available through MOPAR for this vehicle. Also known as the “Out-of-Control” flame kit available in Red/Orange or Blue/Purple color combinations, kit is no longer offered through OEM channels. While design and sizing is very close to OEM specs, divergent production processes result in color and fade variants from that of the original kit. Thus, in the event original graphic requires replacement, full removal and replacement is recommended. 1/3 scale Color Samples of Door Flame set are available. ‘Click’ Here for more information.